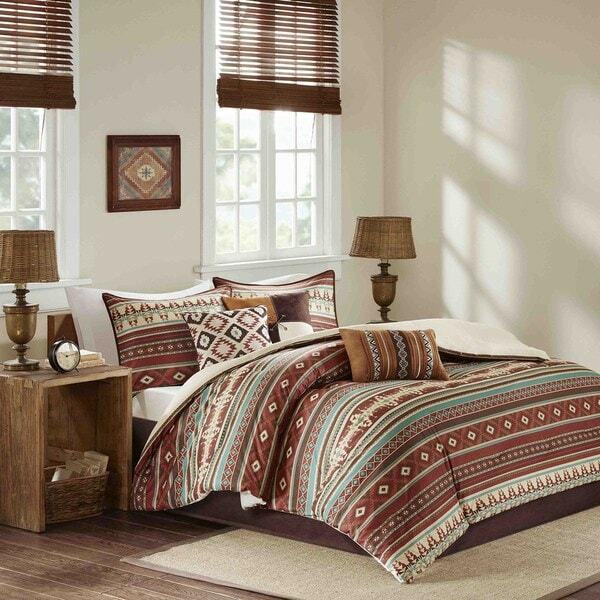 This comforter set is soft and colorful, perfect for our Southwestern themed guest room. It is true to size and covers the sides of our deep mattress nicely. The quality is nice for the price. Celebrate your love for Southwestern aesthetics with this rustic 7-piece set from Copper Grove. Made from 100-percent polyester, this durable set features a striped pattern with classic red, brown, and turquoise hues. The included brown and cream-colored throw pillows will pair well with wood decor and off-white walls. It fits our California king perfectly. The comforter is softer than expected and has a nice weight. The throw pillows are very nice too. All in all we are very happy with this purchase. I would recommend this comforter set to a friend. It is well made . The material is nice. The colors are nicely coordinated and go well with the decor. The room is not western themed and despite that it goes well with our decor. We are looking forward to many years of use in our guest bedroom. Great quality and true to the photo! The colors are amazing and the comforter is very warm! I love the coordinating throw pillows! The pillow shams are a great quality as well! 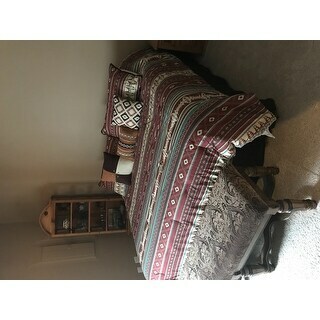 Very happy with this comforter set, a lot of decorative sets are not the most comfortable, however this is incredibly comfy and fits wonderfully! Overall a good value; 2 of the accent pillows aren't as well matched as they could be, but we really like the look of the set. Completes the decor without being overbearing. I was skeptical but this set is beautiful. Colors are soft as well as the comforter. Adds such warmth to our guest room ! The accent pillows are a lovely finish! This is a great comforter set. We wanted something with a southwest type design. The neutral colors with our bedroom. Very nice looking throw pillows. Very happy with this purchase. The quality was good- it's very soft, the appropriate size, and the same pattern as shown in the photo. However, the colors are not as the photo shows. Anywhere you see that neutral cream color in the photo, the blanket had an ugly yellow in reality. 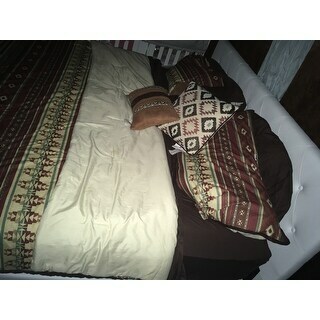 Additionally, the pillows did not match the blanket (they were more cream-colored, as shown in the photo). This made it look extremely cheap an not nearly as elegant/classy. I will be returning the item. UPDATE TO THE BELOW REVIEW!! I DONT KNOW WHAT THEY USE FOR THE DYE IN THESE BUT I WASHED IT AND THE PRINT WENT ONTO THE OTHER SIDE!!!!!!!!!!!!!!!!!!!!!!!!!!!!!!! WAIST OF MONEY!! I WASHED WITH GAIN LIKE ALWAYS!!!! I wish there was a 10 star!!! I am absolutely in love with this bedding!!! My first purchase on OVERSTOCK and I am happy and can’t wait to continue!!! Wish my credit limit was a bit more...maybe one day!! :)The only think that was wrong is one of pillows had a broken place. :( But I still love the set in general!! It’s soooo pretty!!! Very pleased! 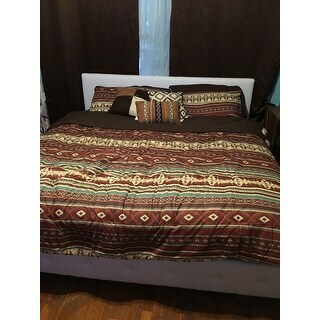 Beautiful comforter set. Love the southwester design. Colors are much prettier than portrayed. Quality is exceptionally well designed. It is exactlly what i was looking for. Could not beat the excellent price any where else. Looks much better on my bed than in the photo; colors are more vivid. Super soft to the touch and a very nice thickness. Buy this , you won't be disappointed. The pictures of this set don't detail how attractive they are in reality. They're very stylish and soft. My daughter was so excited to have received such a great set for her bed. 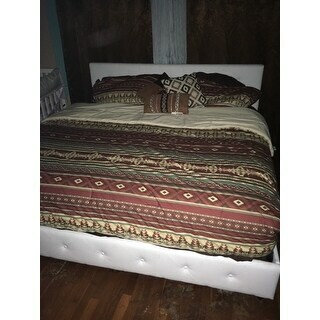 Such a soft and great quality bed set. Definitely recommend. "Is this a light weight comforter?I’m looking for something a little less heavy for the warmer months." This is considered a heavy comforter. It’s not thick but it is polyester so it doesn’t really breathe well. 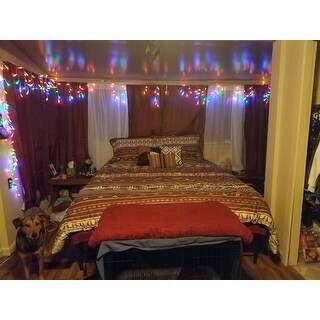 Goes with the theme and colors of our bedroom.